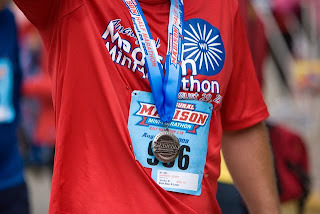 Saturday was the first inaugural Madison Mini Marathon. When I signed up for the race several months ago, I was excited to do it since it was a local race, but was sure it would be 90 degrees since it was August. Well wasn't I pleasantly surprised when the week turned out cool. Forecast for Saturday was a low of 52 and a high of 65. Awesome! The race was on Saturday morning, so I hit the sack nice and early to get some rest. I was in bed by 9:00. Unfortunately, I have been doing electronic document review at work and I just could not shut the old noggin off. Every time I closed my eyes, I saw document after document. My husband got home around 12:30 and by that time I was MAD. Here I was, lying wide awake, 3 hours after I went to bed. I almost just shut off my alarm and said, forget it. But I didn't. I tossed and turned for about 2 more hours then drifted off. You can imagine 4:30 wasn't all too pleasant when my alarm went off. But I bounded out of bed and got ready for the day. I was a bit concerned about this race because: (1) my training has been all over the board this season; (2) my legs were somewhat shot; and (3) I haven't had a good race in a LONG time. As I got ready before the race, however, I tried to push those concerns out and just have a good time. It was a perfect morning for a race. I CAN DO THIS. My friend had signed her husband up for "VIP status" but he could not race, so she transferred it to me. Boy was that cool. There was a big room for all the VIPs and we could hang out there, drop off our gear bag and use restrooms with short lines. I ran into Donovan, and it was fun to have a familiar face pre-race. We chatted for a while and then hit the start line. I did not get preferred seeding because I did not get my entry in on time, so I snuck up as far as I could. They played the Star Spangled Banner, and as always, I felt so happy and lucky to be there. It was a pretty slow start and the first section is up a long hill. Around the half mile mark I was at an 8:10 pace. But then we had a downhill toward the square and the crowd opened up a bit so I was able to pick up the pace. Clicked off first mile at 7:13. Oops - that was a bit fast. But I felt good so I just went with it. It was nice being in a bigger race with lots of people to run with. The last couple of races I have done were tiny races and by mile 1 I was running alone. It was nice to have people pull me along. I was still running a bit faster than I should have been, but I was feeling really good. We looped over to the zoo entrance and I tipped my hat at the spot where James' guardian angel caught him a few weeks ago. The route was now a backwards route of the arboretum loop that so many Madison races take. I never seem to run well in the arb, but I decided today it was mine. As I turned into the arboretum, a cop car had Soft Cell's Tained Love blaring. Ha. Once in the arboretum, I was determined not to lose my focus and dramatically slow down. It was nice because here I was able to break up the race - only a couple miles until I'm out. I kept waiting to blow up and feel terrible, but fortunately it never happened. There was a strongish headwind at mile 10, but it actually felt welcome. The last couple of miles I was able to pick it up some. As I got close to the Memorial Union, I heard John screaming at me. I blazed down through the finish with lots in my tank and I was very pleased to have gone under 1:40.
very, very nice. I predict a very very nice Steamtown as well. I echo what they said: very nice! And what a treat to have such great race day temps in August! Your (lack of) sleep is exactly how I was before Grandma's. I swear I only got an hour of sleep that night and I was so MAD every time I looked at the clock and I still wasn't asleep! VIP does rock. Well worth the $25 that you pay (if you're not as connected as you and I).